I intend to write more about these two lessons, but for now I’m just posting a couple of pictures and first names. I’ll add more to this entry later. Right now I’ve got to get ready for work. These guys are from Salida Middle School: Evan, Garret, Cody, Christian, Luke, Issac. They are 7th and 8th graders. The totally rip. I had to work to keep up with ’em. Thing they liked doing most was 360’s, 180’s and Grabs. These guys and girl are from Custer County School in Westcliff, Colorado. 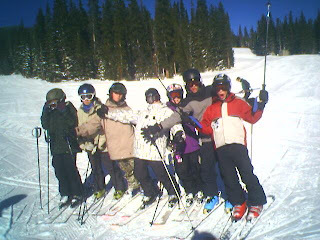 They were with a group called the Snow Cats. From right to left here is Zoe, Griffin, Andy, and Ryan. More later on how these lessons went. Have a great day! Monarch has 5 inches of new and it’s still snowing!